He was a sickly kid, but later turned into a great soccer player in college and solid newspaper writer. He’s our old friend Bram. Yep. Bram Stoker’s immortal “Dracula” went on sale in late May 1897. Never know what you might discover in the dustbins of history. Here’s what’s cooking for you at week’s end: Roasted chicken breast over crispy polenta with fresh tomato sauce, and a shrimptastic po-boy Friday. Roasted chicken breast with fresh tomato sauce over crispy polenta with savory-sweet green beans. Wonderfully seasoned and roasted chicken breast tops a crispy polenta cake with fresh tomato sauce, and it comes with our savory-sweet green beans, house bread, and house salad. Roy Orbison notes, “I may be a living legend, but that sure don’t help when I’ve got to change a flat tire.” Yes, most of us are humbled before the difficulties of operating a car. This polenta, though, will make you famous and smart (and you can wear cool glasses like Roy), and it just might help you change a tire. Yep. 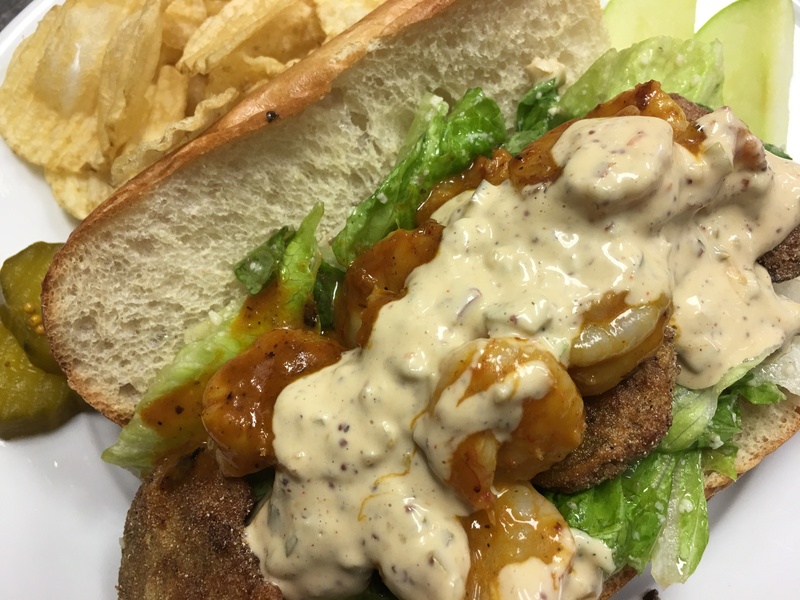 Shrimptastic Friday: Barbecued shrimp stuffed po-boys or fried green tomato and shrimp po-boys with house-made remoulade sauce. Take a half-size po-boy, hollow the bread to make a bread cave, stuff it with our own New Orleans style barbecued shrimp (prepped in loads of butter, white wine, and saucy spices), cover it with barbecue sauce, and grab the napkins. Or grab our fried green tomatoes, add some shrimp sautéed in our barbecue sauce, our house salad with house-made dressing, some remoulade sauce, and you’ve got a little more than a po-boy, you’ve got a “Whoa-boy.” Pete Hegseth shares, “Memorial Day isn’t just about honoring veterans, its honoring those who lost their lives. Veterans had the fortune of coming home. For us, that’s a reminder of when we come home we still have a responsibility to serve. It’s a continuation of service that honors our country and those who fell defending it.” Have a blessed weekend, remembering those who’ve served our country so well, especially those who didn’t come home and their families. Uncle Milton Berle quipped, “We owe a lot to Thomas Edison — if it wasn’t for him, we’d be watching television by candlelight.” Have a blessed and happy Memorial Day weekend!